The Complete Disney Toy Story Movie Collection (Blu-ray Box Set) Deal! Home Amazon The Complete Disney Toy Story Movie Collection (Blu-ray Box Set) Deal! My daughter was just watching Disney Toy Story 2 recently. I even sat down and watched a bit. I think the first Disney Toy Story Movie is my favorite Disney Movie ever! You can get The Complete Disney Toy Story Movie Collection for a crazy low price right now on Amazon! Hurry and get the The Complete Toy Story Collection 1, 2, 3 [Blu-ray Box Set Disney] today for only $24.39 from Amazon! That’s just over $8 each movie! Check out all of the recent Amazon deals here! Please note that Disney Rewards are not available in the US (only available in the UK). Toy Story There is greatness in a film that can be discussed, dissected, and talked about late into the night. Then there is genius that is right in front of our faces–you smile at the spell it puts you into and are refreshed, and not a word needs to be spoken. This kind of entertainment is what they used to call “movie magic” and there is loads of it in this irresistible computer animation feature. Just a picture of these bright toys on the cover of Toy Story looks intriguing as it reawakens the kid in us. Filmmaker John Lasseter’s shorts illustrate not only a technical brilliance but also a great sense of humour–one in which the pun is always intended. Lasseter thinks of himself as a storyteller first and an animator second, much like another film innovator, Walt Disney. Lasseter’s story is universal and magical: what do toys do when they’re not played with? Cowboy Woody (voiced by Tom Hanks), Andy’s favourite bedroom toy, tries to calm the other toys (some original, some classic) during a wrenching time of year–the birthday party, when newer toys may replace them. Sure enough, Space Ranger Buzz Lightyear (Tim Allen) is the new toy that takes over the throne. Buzz has a crucial flaw, though–he believes he’s the real Buzz Lightyear, not a toy. Bright and cheerful, Toy Story is much more than a 90-minute commercial for the inevitable bonanza of Woody and Buzz toys. Lasseter further scores with perfect voice casting, including Don Rickles as Mr. Potato Head and Wallace Shawn as a meek dinosaur. The director-animator won a special Oscar “For the development and inspired application of techniques that have made possible the first feature-length computer-animated film”. In other words, this movie is great. –Doug Thomas Toy Story 2 John Lasseter and his gang of high-tech creators at Pixar create another entertainment for the ages. 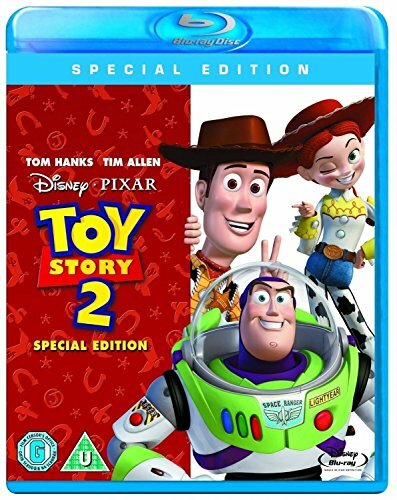 Buy the The Complete Toy Story Collection 1, 2, 3 [Blu-ray Box Set Disney] from Amazon.